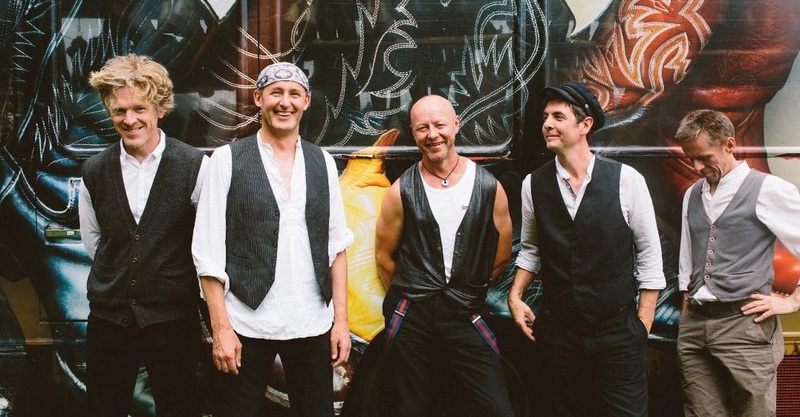 Just as The Rolling Stones and The Who are still rocking all over the world well into their 70s, so too have more recent bands built reputations on making new music accessible regardless of their age – which is exactly what sea-shanty folk group The Salts are all about. Founded by singer and guitarist Jeremy Hart, the band – which proudly boasts a collective band age of 265 – fuses maritime, seafaring musical tradition with their own energetic and unique sound. Initially playing pub gigs in and around Surrey, the quintet soon realised that they were onto something with their sound. It wasn’t long before they released their debut album, She Rises, and began performing in theatres and joining a wide range of festival rosters, before securing a record deal with Braccan Records for their follow-up release, Brave, due for release on April 20th this year. Not bad for a bunch of oldies, right? And what’s with the ‘record deal’? Do those things even exist any more?! “Many artists, probably younger and more media-savvy than us, do self-publish, but we’re too old for that and have jobs, families and mortgages,” Jeremy continues. “So this is a great route and opportunity for us. Today, the line-up comprises Jeremy on vocals and acoustic guitar, along with Brian Doran on vocals and mandolin whistle, Lee Collinson on vocals and banjo, Richard Nash on vocals and drums, and most recent member, Tim Cantrell, on double bass. Despite their seasoned status as older rockers, they remain unfazed by any stigma, accentuating the positives in their level of experience, which can only come with age. “I think our age is a benefit, as the sort of music that we do lends itself to our current ages,” explains Jeremy. “After all, we’re not a boy-band bunch of rappers – if anything, we’re more ‘hip-op’ than hip-hop! So, what are the challenges that they face as an older group? But the show must go on, as a whole host of live Brave dates have been pencilled into the band’s diary, including upcoming shows at Croydon Folk Club, The Old Court in Windsor and Chatham’s Brook Theatre in April, to name but a few. As for still getting, shall we say, ‘special attention’ from their adoring female fans backstage after a set, however, they’re not holding their breath when it comes to groupies. “I wish – we don’t even get ‘gropies’!” laughs Lee. It’s clear that these guys have lost none of their sense of humour, and don’t take themselves too seriously – except when it comes to the music, of course. With the new album and record deal, they’ve certainly pushed themselves further, but Brave is only one part of the puzzle, paving the way for more radio play, better festivals and bigger venues, while growing their audience and gaining new fans. Which isn’t to say that they’re stuck in the past, of course, as they’re well aware of how much the musical landscape has changed in 2018. It’s this transience that has become a big appeal for The Salts and their followers, safe in the knowledge that, despite appearances, preconceptions or stereotypes, age really is just a number as far as rock and roll is concerned. As for what’s next for Jeremy and the boys, only time will tell. But one thing’s for sure – they’re not letting their age slow them down, and are going to keep rocking ‘til they drop.